Approximately one year ago, at the beginning of my freshman year at college, I was required to attend an NYUAD Institute talk about coral reefs made out of crochet. In all honesty, I wasn’t entirely keen – I felt typical teenage angst at “being forced to attend an event by an authority figure” and I complained about my forced attendance throughout the bus ride to the Intercontinental Hotel auditorium. Much to my surprise, all of my complaining was ultimately overpowered. The flawless combination of mathematical and artistic calculations that Margaret Wertheim, one of the two sister artists, presented in a slideshow captivated me. I had never encountered such an elegant and creative approach to cold, raw science. The Crochet Coral Reef project started nine years ago, when the Wertheim sisters were watching television and experimenting with various forms of crochet. Margaret claims that her sister Christin said, “we could crochet a whole coral reef.” The rest is, as they say, history. This community project, guided by the Wertheim’s Los Angeles-based Institute for Figuring, has spread to over thirty cities in attempts to create consciousness about what’s happening to coral reefs. Global warming, pollution, and general neglect has created an environmental tragedy that puts the fragile ecosystems of coral reefs all over the world under increasing strain. 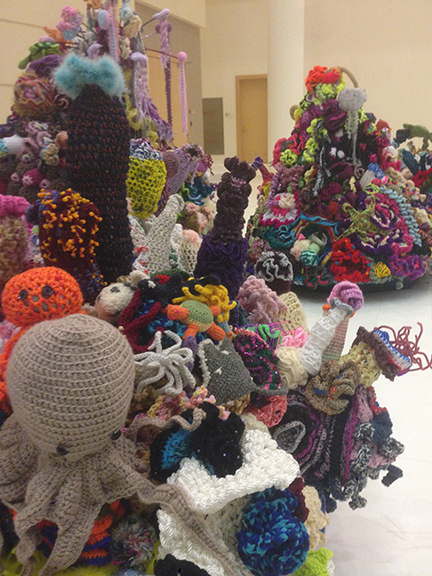 Over seven thousand people have crocheted their own coral reefs to support the project. Many of these individuals may have been intimidated by the scientific goals of the project, but the creative nature of the Crochet Coral Reef project has involved people from all walks of life. For the past year, the NYUAD Institute, guided by Pamela Mandich, coordinated crochet workshops that taught people from NYUAD and elsewhere about hyperbolic geometry (an alternative to the more standard Euclidian geometry taught in schools), crochet, and coral reefs, under the tutelage of Margaret and her sister. Once individuals learned the basic crochet stitch, their imaginations were the only limit. An entire year of crocheting and imagining has culminated in the grand opening of the exhibition in the university’s new Saadiyat island campus. The Satellite Reef features a beautiful and intricate system of seven standalone islands created by members of the wider Abu Dhabi community, complemented in the exhibition by some of the Wertheim sisters’ own work. This satellite coral reef is the first in the Gulf region and it uniquely assimilates and reflects its host country’s culture. For one, the seven islands each represent a separate emirate, and Emiratis, expats, adults, children, residents and visitors alike have collaborated to create them. Curiously, the process to create our satellite reef has been similar to the biological phenomenon that forms natural coral reefs. Most significantly, each island’s understructure is made out of traditional hand-crafted Emirati fishing pots. Amongst turtles, corals and starfish, the NYU Abu Dhabi satellite reef boasts the region-specific gleam– glistening threads in flashy metallic tones, lively color choices and knitted wildlife join together to form a surprising, and beautiful, piece of art. During the grand opening of the exhibition, Abu Dhabi’s dynamic and diverse community joined together to celebrate their communal accomplishment. 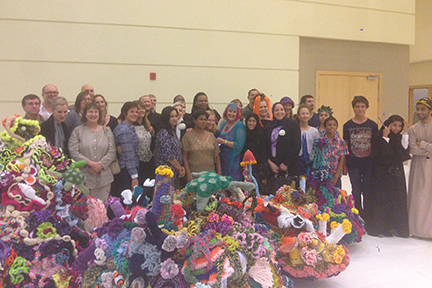 Faculty, staff and students of the university and members of the wider Abu Dhabi community mingled amongst coral-themed accessory choices – crochet coral pins and crochet head-dresses, amongst others – and admired the community’s work. Both Christine and Margaret were present at the opening, chatting with the various contributors to the project and talking about their own pieces at the exhibition. Finally being able to see the product of what started off as a course-mandatory institute event, I was thrilled to see not only the art itself, but also the mixture of people who were part of the process. The halls of the university’s Arts and Humanities building were buzzing with life during the event, as contributors from all sections of Abu Dhabi gleamed at the outcome of their work. One reef at a time, we begin to stitch together a community in our new and permanent home. The exhibition will continue through December in New York University Abu Dhabi’s Arts and Humanities building and is free for anyone to visit. For more information about the project, you can access the University’s page on the satellite reef here and the Wertheim sisters’ Crochet Coral Reef project here.